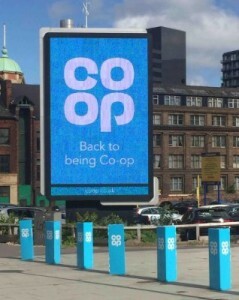 Listening to market research, they made the bold move to shorten their name to simply "Co-op", to reflect how many of us refer to the group, whether it be the food stores, banking or funeral care. And while the banking side may stick with its current branding due to other connections, we can expect to see the new look being rolled out nationwide, straightaway. The change is said to restore the group's pre-eminence back to its former success and prestige as seen in the 1960s. We have seen the quickest change already, in their carrier bags, as our very own Matt Townsend models from a trip today. 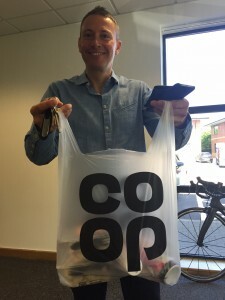 We will then begin to see new packaging for Co-op's own branded products, along with new uniform for their staff while it is understandable that to alter every store shall take a number of years to complete. Most notably, for us, is the rebranding of the Group's individual websites, with each one being brought into line with the new name and style. The result is a clean, sleek look which can often be tricky to achieve, especially with so many well established departments fighting for their own presence. 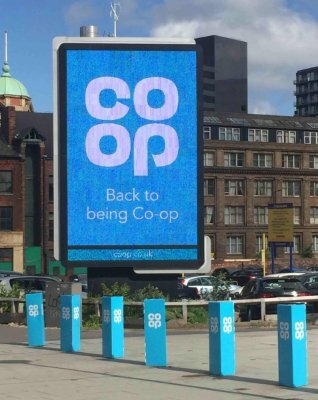 But, as they say so themselves, membership is at the heart of everything that the Co-op stand for, encouraging collaboration and reinvestment into each area. “We are on the verge of creating a new Co-op economy, one where the trade from our members clearly benefits them, their communities and our thousands of suppliers,” explained Leighton.